(leading to ExpertRating Photography Training Certification-II). Designed for both film and digital photographers, this course is filled with tips and tricks to help you take better photographs. You'll learn the basic technology that all cameras use, and you'll receive helpful information on exposure and lighting. You'll also explore strategies for taking excellent photos in all types of situations, including portraiture, landscape, macro and still life. This course includes a knowledgeable and caring instructor who will guide you through your lessons, facilitate discussions, and answer your questions. The instructor for this course will be Beverly Schulz. About the ExpertRating Online Photography Course instructor : Beverly Schulz is a freelance photographer and a graduate of the New York Institute of Photography's Professional Photographer's program. She teaches a number of classes in digital photography and has more than 25 years of classroom instruction experience. Her writing and photography have been published in a number of magazines. She has traveled extensively and participated in onsite photography workshops as well as independent photo quests. In addition to teaching and photographic work, she provides consulting services for digital photographers and clients. Online Photography Training Course requirements: For taking this instructor led ExpertRating Online Photography Course you need A digital or film camera, Internet access, e-mail, and the Microsoft Internet Explorer or Mozilla Firefox Web browser. "A warm and friendly instructor. I learned a lot of practical and useful knowledge in this photography class. There are so many online courses offered and the selection increases every time I look. I only have the time for one at a time but wish I could take more because so many practical subjects are offered. I learn much more this way than attending on campus. Love the discussion areas. In a physical classroom situation, oftentimes a teacher can get bogged down with students' questions and aspects of the lessons do not get covered because of lack of time. Sometimes questions do not get asked because of this. Wish this type of learning was offered sooner." "Beverly changed my photography skills the second I finished reading the first lesson. I was able to put everything into practice and I have amazing photos to show for it!" "Beverly Schulz is a superb instructor. I have taken several courses from her and can't say enough about her teaching style, humor and warmth. I wish there were more courses offered by Dr. Schulz." "Compared to many of the students, I'm a real novice with novice equipment. Nevertheless, the many and varied suggestions of the marvelous instructor have helped me a lot. I understand my camera much better and am considering upgrading. In fact, the other day I drove into a local shopping mall, noticed the light on the trees with their fall color and wished I had a camera with me!" "Even though I wasn't very vocal during the course I did benefit from it very much. I would love to take another class by this instructor. She has a great personality, is an expert in her field, and provides so many resources and GREAT comments and tips! I have truly loved taking this course! I definitely do not regret taking it!!" "From day one, I felt the lessons were providing valuable information and techniques that have improved my ability to take pictures. The supplemental information was invaluable. Although I did not contribute to the discussion groups, I did review them and found a lot of information and positive feed back from the instructor and assistants. Great course, thank you." "I enjoyed the course greatly, the course content was exactly what I needed and expected. I feel I have gained a lot of insight and knowledge into the world of photography. Many thanks to the instructor." "I enjoyed the course. It improved my camera use, and my knowledge of it." "I enjoyed this course very much! I've been experimenting with photography for a while now and this course pulled together the bits and pieces of knowledge I've discovered on my own. It's also given me many new ideas to try as I continue learning about this fascinating field!" ExpertRating is one of the world's only ISO 9001:2015 Certified companies (from TUV America) offering an Online Photography Course (leading to ExpertRating Photography Skills Certification). When you choose the ExpertRating Online Photography Course you can be sure that you are buying a premium International certification that is recognized by hundreds of employers and Government bodies in the US and other countries. With ExpertRating you get certified quickly online and you are equipped with a store house of information through the in-depth ExpertRating Online Photography Course Courseware which has been developed by experienced Photography Experts. The ExpertRating Photography Certification is by far the best value for money instructor led Photography Program at $129.99. How much does the Photography Certification cost and what does it include? You can buy this ExpertRating Online Photography Course leading to Photography certification at a special offer price of only $129.99 which includes the in-depth ExpertRating Online Photography Course Courseware and exam fee. This is the best value for money Photography Program available till date. You get the following services within the USD $129.99 fee. In-depth ExpertRating Online Photography Course Courseware including scenarios and case studies. World wide airmail delivery of the hard copy Photography Certificate. 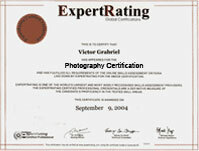 The Photography Certificate can be used to prove your certified status and does not mention the words "online". The process of getting yourself certified is very simple. All you have to do is buy the ExpertRating Online Photography Course for $129.99. Log in to the instructor led course using your password. Go through the ExpertRating Online Photography Course Courseware (which would take you 6 weeks) and complete the final Photography Certification exam at your convenience. You can complete the exam within 2 months of buying the Photography Certification. The result of the exam appears as soon as it is completed, and your Photography Certificate is mailed immediately. Chapter assignments to help you practically use the Photography that you will learn during the Photography Course. The final exam is fully based upon the ExpertRating Online Photography Course Courseware that is provided along with the Photography Certification. If you have gone through the courseware properly you should not have a problem clearing the exam. The exam consists of multiple choice questions from all chapters of the ExpertRating Online Photography Course Courseware. According to the US Bureau of Labor Statistics, photographers held about 122,000 jobs in 2006. This course is a blessing for budding photographers and even professionals who intend to take efficient and high quality photographs. The ExpertRating Photography course will help you excel in the art of digital photography. However, it is also important to remember the old adage, “practice makes a man perfect”. In this first lesson, you'll learn how to develop your photographer's eye and incorporate composition guidelines as you take great pictures. This information will provide a solid foundation for the rest of the class. In this lesson, we'll take a look at the options available in camera equipment. Whether you have a point-and-shoot camera or the latest digital SLR, you'll gain a better understanding of the equipment and tools photographers use. Even if you're a digital photographer, a basic understanding of how film works and the process digital technology has copied is an important aspect of getting better pictures. In this lesson you'll learn about film types, ISO speeds (for both film and digital cameras) and ways to protect and use film wisely. Light is the essence of photography. In this lesson, we'll explore how to control and use light to your advantage. You'll compare the advantages of natural light, available light and artificial light and see when you'll want to use each to capture the special effects you're after. If exposure is still a mystery to you, you'll have a chance to see it in a whole new light. You'll explore spot metering and silhouettes, capturing motion, and depth of field along with ways to use your camera to achieve the desired results. As you move into the second half of the course, you'll use the technical information from the first half in a variety of specialty areas. In this lesson, you'll learn the tricks of portrait photography. Whether you're working professionally or just as the family photographer, these techniques will help you take better portraits. Photographing children, pets and groups is a challenge for even the most seasoned professional photographer. In this lesson, you'll learn some techniques and strategies to get the best from all of your efforts. In this lesson, we'll explore the exciting world of travel and outdoor photography. You'll get the opportunity to fine-tune your landscape strategies and use the manual settings on your camera. We'll also discuss photographing wild and captive animals. Photojournalism is a fascinating field for photographers. This fast-paced world presents challenges of its own. In this lesson, you'll see how the pros handle this type of work. We'll also discuss how to get started in the field. Still photography and macro work use different techniques than many of the other subjects you'll learned up to this point in the class. The equipment and subjects you choose play a big part in your success. We'll discuss the process and also look at some forms of specialty work. Whether you take your photos with digital or traditional equipment, digital editing is a real bonus for photographers. In this lesson, you'll learn about the basic and artistic editing techniques available to all photographers, as well as some of the technical issues of digital photography. Our last lesson looks at ways to display the perfect print. We'll explore printing preparation, framing options, and creative ways to display your images.